The awards keep piling up for New York fashion darling Joseph Altuzarra, who was named Womenswear Designer of the Year by his peers at the Council of Fashion Designers of America (CFDA) in a formal ceremony at Lincoln Center in Manhattan Monday night. The designer, who was nominated for the award for the first time this year -- his eponymous label is only six years old -- beat out more established rivals, including nine-time winner Marc Jacobs and Alexander Wang, for the top honor. This was the second time Altuzarra has been recognized by the CFDA, having picked up the award for emerging womenswear designer in 2012. 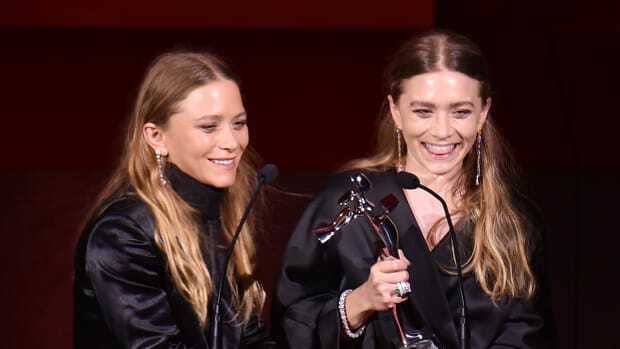 The evening&apos;s other top honorees included Public School&apos;s Dao-Yi Chow and Maxwell Osborne, who were jointly named Menswear Designer of the Year, and The Row&apos;s Ashley and Mary-Kate Olsen, who were together awarded Accessories Designer of the Year. The awards for emerging designers, officially dubbed the "Swarovski Awards," were given to Shane Gabier & Christopher Peters of Creatures of the Wind for womenswear, Tim Coppens for menswear and fine jewelry designer Irene Neuwirth for accessories. In addition to the awards decided by vote, Rihanna -- wearing a see-through, sequined gown and headdress with a fur stole -- was recognized as style icon of the year, while Tom Ford was honored with the Lifetime Achievement Award (which opened with an adorable tribute from his husband, Richard Buckley). Bethann Hardison was given the Founder&apos;s Award for her work in promoting racial diversity in the industry; Ruth Finley the Board of Directors&apos; tribute for her organization of the Fashion Calendar for seven decades; Raf Simons the International Award for his work at Christian Dior; and Allure Creative Director and KCD co-founder Paul Cavaco the Media Award. Note: This story was updated to reflect that Tim Coppens, not Todd Snyder, won the Swarovski Award for menswear. And John Waters is hosting. Tom Ford, Tabitha Simmons and Rosie Assoulin also took home prizes from the annual "Oscars of fashion."